Kicking off 2016 with a sweet recipe. Happy is the new healthy. When I was thinking about what to call my business this go-around I wanted to find something that really represented my approach, that was really me, and I found it surprisingly difficult. I stayed awake at night playing word association games, bounced ideas off of friends and family, and at certain point I got so frustrated I almost fell back on “Jamie Berk Health Counseling” from my early days counseling in NYC (I mean, it is literally me isn’t it?). So. Boring. I don’t even remember how or why Fork Life & Spoon popped into my head, but when I landed on it I knew that it was exactly what I was trying to communicate; It is possible to make simple choices everyday, food or otherwise, that make sense for you personally and that truly nourishing yourself can (and should) be uncomplicated. The choices are “healthy” not because they are loaded with antioxidants or pesticide free, but because they are realistically and carefully selected to suit your lifestyle. When you represent yourself as someone in the nutrition field, people watch you carefully. You get labeled as a “healthy” person. Some people are confused that I am not munching on seeds all day, their eyes burning a whole into my hand as I reach for another chicken wing. A gorgeous plate of cookies is presented with apologies. I get questions about the amount of sugar in wine at a cocktail party as I refill my glass. Just enough, I say. There are so many ways to eat well. The trick is to find a way that is actually for you and to not ignore the life part, which is undeniably in the middle of everything. Otherwise you are just trying to fit a gogi berry smoothie into a square hole. Nutrition dogma can be loud, but the cleanest of diets are of no value if they are causing you stress. Cooking at home is a perfect place to experiment and find what being healthy means to you. Cook the things that you like and use quality ingredients. Don’t get hung up on the fat or sodium content. Just play. There will be millions of meals in your lifetime, not every one will be perfect. Here is a sweet recipe to kick of 2016. Bonus, it will be on the table faster than any delivery guy could be at your door. Serves 1, but can be easily multiple to feed a crowd. Preheat oven to 240 C/475 F. While your oven is warming up scrub the potato and rinse well. Cut into long wedges by cutting in half length and then each half in thirds. Place the wedges skin side down on a baking sheet with the garlic cloves, drizzle with olive oil and season with salt and pepper. Bake for 20-25 minutes or until the edges are golden and the insides can be easily pierced with a fork. The garlic should be browned and very soft, if they are not leave them in a bit longer while you wilt the greens. In the meantime rinse the greens (if using larger leaves you will have to chop them). In a saucepan over medium heat, add a few teaspoons of water, your greens and a pinch of sea salt. Cover to wilt about 4 minutes. Uncover and remove from heat. In a small bowl , smash the roasted garlic with the back of a fork into a paste and fold in the goat cheese. Plate the greens, top with sweet potato wedges and a generous spoon of the garlic cheese. When ready to serve, splash with a bit of balsamic and olive oil and sprinkle with chili flakes. 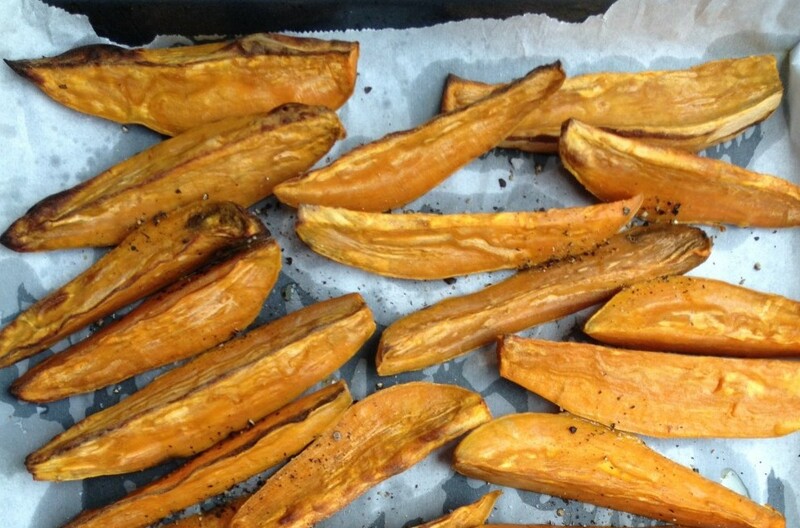 *Roasted sweet potato is a great winter treat which helps to curve sugar cravings. Don’t hesitate to roast more than you need for one recipe and keep it on hand for the week. Same goes for the roasted garlic- keep roasted cloves in a jar and mash into salad dressings, soups, butter, cooked grains, honey…the possibilities are endless.